The globalisation and mass consumerism of the late 20th century and early 21st century have been examined and re-examined time and time again by artists, for the simple reasons that such subjects have proved an extremely reliable font of inspiration and have never lessened in their relevance. 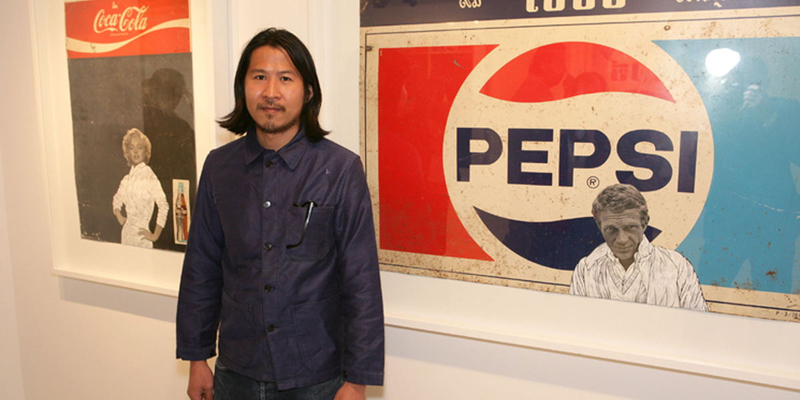 Drawing upon such found objects as old metal advertising signs collected in his Thai homeland, the now London-based artist Pakpoom Silaphan has come up with his own incisive and distinctive commentary, constituting a reinterpretation of pop art and an opening of discourse on how advertising and mass consumption affect and define our lives. 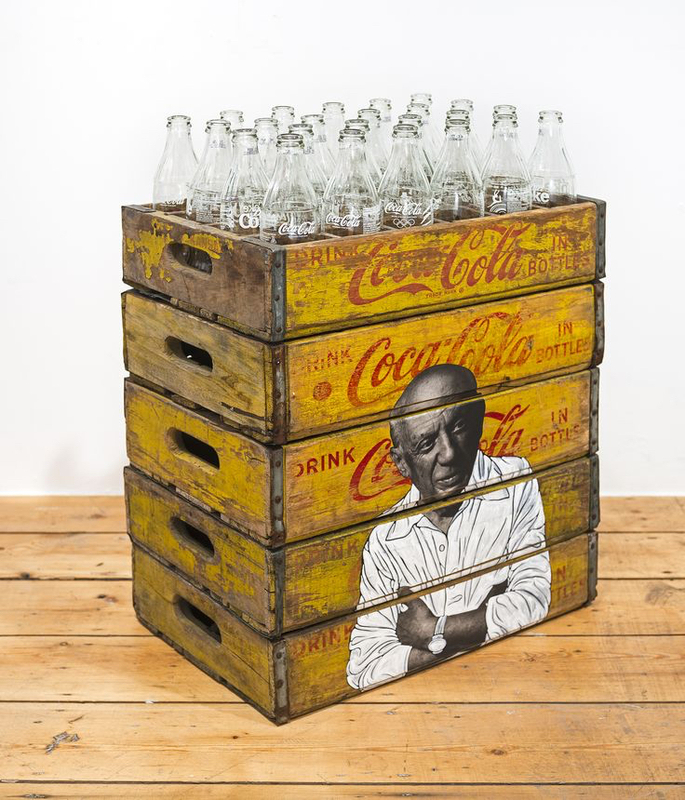 Silaphan has become no less associated with his use of vintage wooden Pepsi and Coca-Cola crates, for example, than Andy Warhol was with his legendary Brillo Boxes. Indeed, the Thai artist has further affirmed the identities of Warhol, Salvador Dali, Picasso, Frida Kahlo and other celebrated creatives as global brands in their own right, through the collaging and printing of their images over the aforementioned branded advertising signs. Pakpoom Silaphan hails from Bangkok, Thailand, where he was born in 1972. After graduating with a BFA from Silapakorn University in his home city, he moved to England in the early 2000s, acquiring a postgraduate diploma in printmaking from Camberwell College of Arts before leaving Chelsea College of Art and Design with an MA in Fine Art in 2002. 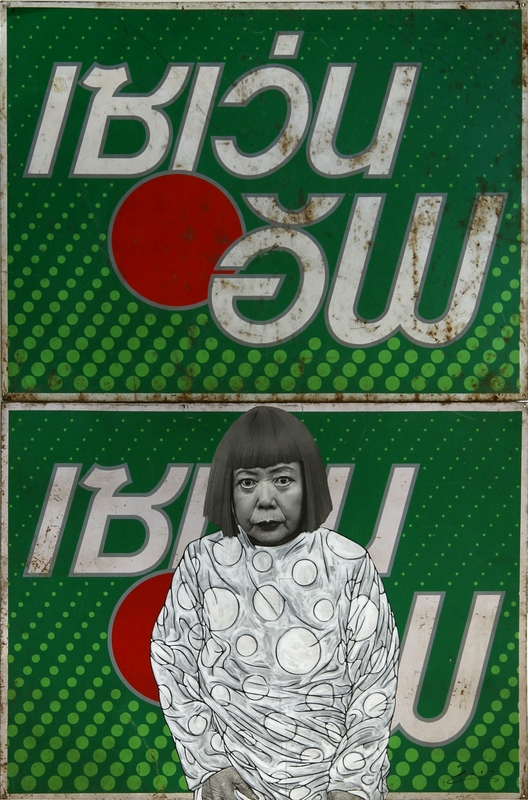 The ability of even those who have never lived in Thailand to recognise immediately in Silaphan’s work the signs and symbols of brands that have long gained currency around the world simply further demonstrates the depth with which such corporate motifs have been imprinted on the collective consciousness. Much the same can be said of the embedding into such thought-provoking works the iconic images of Bob Marley, Yayoi Kusama, Muhammad Ali, Mahatma Gandhi and other celebrated figures to have become perpetuated with ever-greater frequency in every area of popular culture in the age of globalisation. Thanks in large part to the deteriorated state of the source material, Silaphan’s pieces also give an intriguing impression of decay. Such engaging commentary on the relationship between East and West in a world where so much now seems the same has attracted no shortage of acclaim and admiration for Silaphan’s work, which has been collected by the likes of Minnie Driver, Sir Paul Smith, Richard Curtis and Harvey Weinstein. He is also represented in the Hiscox Collection in London, the Seavest Collection in the USA and even the collection of The Coca-Cola Company. All the while, Silaphan has also built an enviable back-catalogue of exhibitions, largely in London at such venues as Scream London and London Art Fair, but also touching on territories including the USA, France and Italy. The concerns around our current, thoroughly globalised everyday life and popular culture that Silaphan communicates through his art are unlikely to go away anytime soon, and much the same can be said of Silaphan himself. What less would you expect of someone who we are proud to declare our latest ‘Artist of the Week’?